In This Drop: Rigor and Reproducibility (Part 2): How Good Are Your Saliva Samples? Rigor and Reproducibility is a three-part series on the steps researchers can take to improve the quality of their salivary bioscience data. Much is being written by the salivary bioscience community on maintaining reproducibility, trueness, and accuracy when selecting assays and labs to perform testing of salivary analytes. This focus is well deserved; Salimetrics assays are designed specifically for human saliva and have the highest level of reproducibility, precision, and accuracy within the salivary bioscience field. However, there’s another aspect of salivary bioscience that gets much less attention, but has the capacity to introduce a high level of error and generate inaccurate results. A simple, incorrect assumption in the collection method, device or technique can introduce significant variability into your salivary bioscience study – at times, even more than the assay itself. The best option for improving the integrity of a saliva specimen is to collect using passive drool. Passive drool is the gold standard, and the method for collecting the best passive drool sample is now standardized (see How to Collect the Best Saliva Samples). Passive drool does not interfere with the salivary analytes being measured, and it permits an expanded range of tests to be performed. 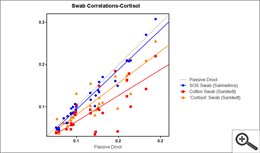 Conversely, swab collection methods are restrictive to what analytes can be accurately measured in saliva, and some widely used swab collection methods introduce variability and negatively affect results. Clearly, however, there are participants including infants and small children where it is not possible to collect using the passive drool method. For these participants, it is essential to select a swab collection method, device and technique that closely matches passive drool and minimizes collection method error. Collection method error was recently highlighted in a review by Gröschl, “Saliva: a reliable sample matrix in bioanalytics”. The Gröschl review identifies two common swab collection methods used in research and states that these methods are identical. However, data shows that this statement is not correct, and the potential implications to a study can be substantial based on which swab is used for collection. A second paper by Büttler, “Testosterone, Androstenedione, Cortisol and Cortisone Levels in Human Unstimulated, Stimulated and Parotid Saliva”, also highlights collection method error. The Büttler paper focuses specifically on the strength and weakness of different collection methods compared to the gold standard of collection methods: unstimulated passive drool. Both papers do well to raise the awareness of collection method error as a source of variability in research. Unfortunately, researchers often choose a specific collection device based on previous collaborations and published studies. Similarly, they may use a meta-analysis which generalized conclusions without relaying the limitations from the original findings. This may cause researchers to overlook important details that can have a big impact on their study. As a researcher, it is necessary to have an understanding that different collection methods, as well as improvements in collection methods and protocols, will directly impact your results. “Better collection” isn’t just a statement; it’s also backed by science. In current research there are two common swab methods for collecting saliva samples; the Salivette® from Sarstedt and the SalivaBio Oral Swab from Salimetrics. The Salivette®, which debuted around 1987, was the staple method for early swab collection techniques. With its simple cotton swab, the Salivette® still maintains its presence as a legacy swab collection device and is useful in a few select fields of study. However, in the early 2000s, based on concerns from the research community related to poor recovery, random concentration spikes, chemical odors, non-hygienic storage, randomized quality control, and lot-to-lot variability, Salimetrics developed a more reliable material. In 2006, Salimetrics introduced the SalivaBio Oral Swab (SOS), an inert, non-cotton polymer swab that maintained sample integrity for multiple salivary analytes. The main benefit to salivary bioscience is that a synthetic swab is not prone to fluctuating measurements like an organic material, such as cotton. When measuring analytes in saliva (EIA/LIA/LC-MS/MS), numerous studies and Salimetrics’ internal data concluded that cotton can introduce errors and interference into salivary analyte measurements, depending on the analyte being measured. To be clear, the Salivette® is NOT the SalivaBio Oral Swab; the material composition, manufacturing, and packaging are different. Salimetrics also performs additional QC testing to verify recovery and conformity across multiple lots to maintain minimal lot-to-lot variability. These are important differences, and Salimetrics has employed rigorous validation criteria to ensure the SalivaBio Oral Swab avoids bias in salivary analyte results. Other swabs introduce bias. Evidence of this bias is demonstrated in Figure 1 below. Presented is a correlation of different Salivettes® and the SalivaBio Oral Swab to passive drool, determined using samples from different individuals, and assayed for salivary cortisol using Salimetrics assay kits. Interestingly, the data in the graph below supports the often cited Shirtcliff paper (Shirtcliff et al., 2001) comparing the cotton Salivette® to passive drool. The conclusion from this figure is significant; cotton is not the gold standard. 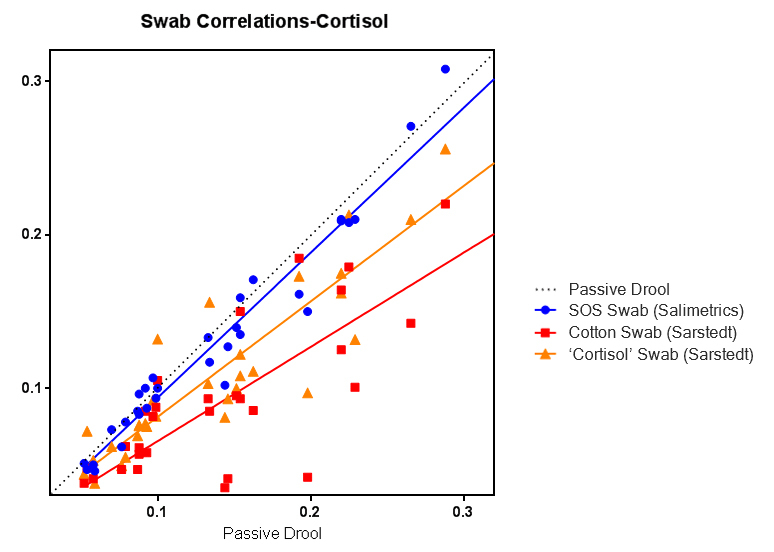 Passive drool is the gold standard and the correlation of the SalivaBio swab to passive drool is an astounding r=0.98 (p=<0.005). If researchers want to use a swab collection method that matches the gold standard and does not impact their data, then the SalivaBio swab is the only choice. There is no other swab method that is identical. 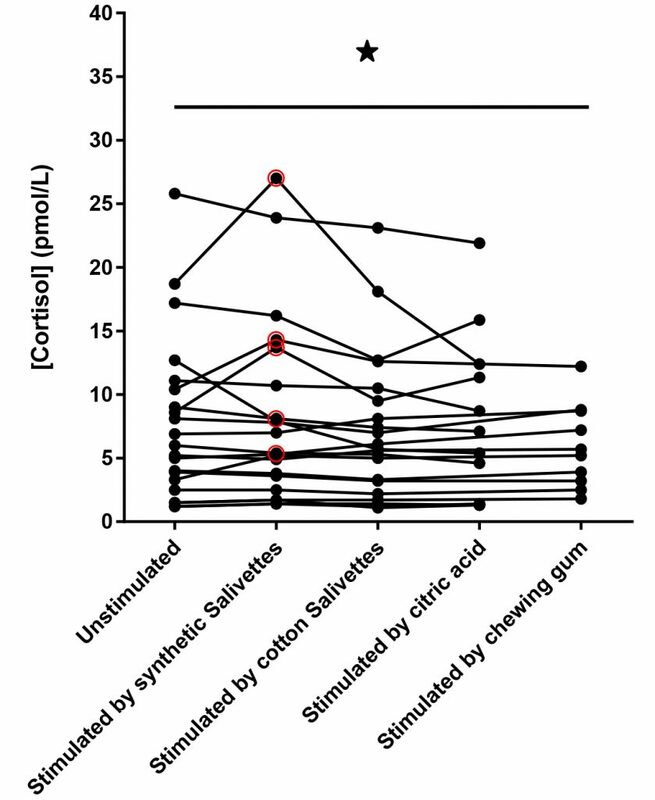 Likewise, the Büttler paper also confirms that salivary cortisol should not be collected with cotton, and more so, cotton should not be used for any of the analytes they tested in their study. Beyond a comparison of correlations for the different collection methods, it is also important to evaluate specificity of the collection methods. This is where the analysis in the Büttler paper that salivary cortisol is “unaffected” when collected with the Salivette® Cortisol is incomplete. While the total mean concentration of each result may be unaffected, the individual samples vary. Figure 2 below represents specificity in relation to measurements from samples obtained by passive drool. The band represents the acceptable range, established by applying a 20% acceptance criterion as a standard. 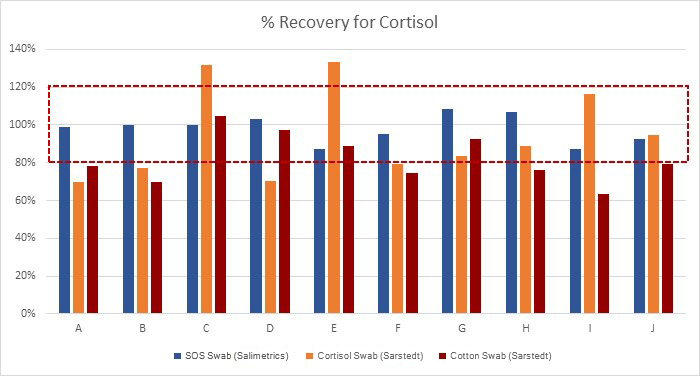 From this data, it can be easily seen that 100% (10 out of 10) of the individual samples collected with the SalivaBio Oral Swab met the acceptance criteria; 40% (4 out of 10) of the individual samples collected with the Salivette® Cortisol met the acceptance criteria; and 40% (4 out of 10) of the individual samples collected with the Cotton Salivette® met the acceptance criteria. This experiment shows that only the SalivaBio Oral Swabs met the acceptance criteria for specificity with salivary cortisol measurements. Note: The SalivaBio Oral Swab was also tested using pooled saliva samples on IBL Cortisol Assay Kits. Results showed 97% and 98% match to passive drool for morning and afternoon samples respectively. Fig. 3. (Büttler et al., 2018). Some researchers also assume that since the Salivette® Cortisol is made from a synthetic polymer, it is also approved for the analysis of multiple salivary analytes. However, Salimetrics’ attempts to validate the Salivette® Cortisol using EIAs for analytes other than cortisol show even higher randomized error. This is an unnecessary additional risk to salivary analysis data. 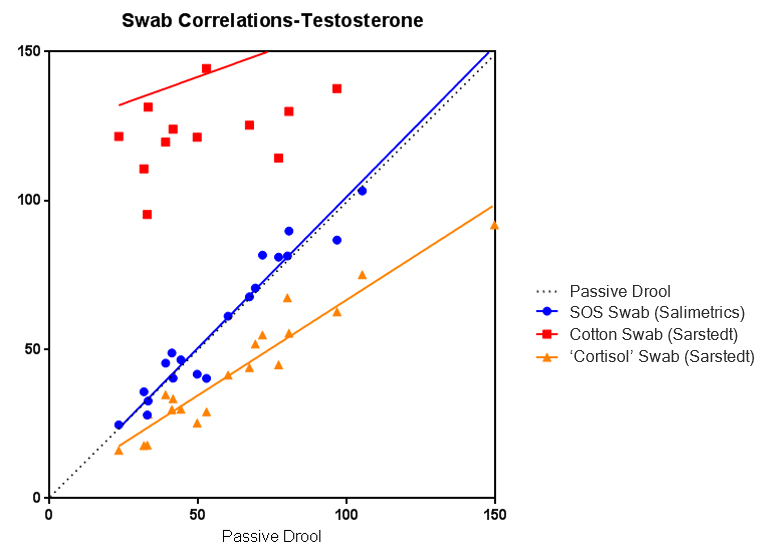 Below is a graph from the validation experiment using the Salivette® Cortisol for salivary testosterone analysis. Büttler et al., also confirmed this finding independently. Finally, it would be a mistake to ignore the value of SalivaBio swabs’ individual, medical grade packaging and its family of swabs adopted for different age groups. It was quickly noted in field research that participants preferred using a swab that was provided in a sealed package. This, in turn, resulted in better participant compliance for saliva collection time points, leading to stronger participant data. Researchers invest a substantial amount of resources in their study and failing to achieve participant compliance is a mistake. SalivaBio swabs are designed to help researchers achieve greater than 99% compliance. Also, many studies include dyads with infants and children, and using different methods that introduce variation can also affect results. Good research considers participant compliance in study design and researchers who choose the right collection device can maximize their final data set with the best possible data. Whenever possible, collect passive drool; it’s the gold standard. When a swab method is required..
Use a swab method that closely matches passive drool such as the SalivaBio swabs from Salimetrics. Use a swab method that does not change the concentration values. Use a swab method only for the analytes that have been properly validated. Use a swab method that increases participant compliance. Gröschl, M., (2017). Saliva: a reliable sample matrix in bioanalytics. Bioanalysis. 9(8):655-668. Büttler, R.M., et al. (2018). Testosterone, androstenedione, cortisol and cortisone levels in human unstimulated, stimulated and parotid saliva. Steroids. 138:26-34. Shirtcliff E,A., et al. (2001). Use of salivary biomarkers in biobehavioral research: cotton-based sample collection methods can interfere with salivary immunoassay results. Psychoneuroendocrinology. 26(2):165-73.